It's hard to believe that it's been over two years since Apogee first announced their new line of products aimed at desktop musicians and audio engineers. While Apogee were already well known in the industry and acclaimed for high-quality converters, master clocks, and the UV22 dithering algorithm, the company had arguably only dipped their toes into the world of computer-based recording, with products like MiniMe and various Firewire or Pro Tools expansion card options. This changed at the 2006 NAMM show, when Apogee announced Symphony, a PCI-based system for handling a large amount of I/O with low latency via the company's AD16X, DA16X and Rosetta-series converters, and Ensemble, Apogee's entry into the Firewire audio interface market. We looked at Symphony in last September's SOS, and although it might seem a little late in the day to be looking at the Ensemble, Apogee have actually been consistently improving the product since its original release (which included beta drivers) last year. For example, they've released a firmware update that allows the Ensemble to work as a stand-alone converter when not attached to a computer. The Ensemble's drivers have also been regularly updated, with the current release from last December (on which this review is based) being fully compatible with both Leopard (Mac OS 10.5) and Tiger (10.4). The Ensemble is designed to work exclusively with Mac computers, and, as such, has a brushed-metal appearance that sits quite happily alongside a Mac Pro, Cinema Display, iMac, or MacBook Pro. The 1U enclosure is about the same size as an AD16X or DA16X converter, and although this is a really minor point, I wish Apogee had made the rack ears removable (as with other interfaces such as the RME Fireface 800 or Prism Orpheus). This would have made the unit look a little more at home on your desk, if it's not in a rack, and stop it from snagging on a bag when being packed up for mobile usage. The rear panel sports sockets for the Ensemble's eight analogue inputs and outputs, along with connections for ADAT and S/PDIF, word clock and Firewire.Photo: Mike CameronSpeaking of mobile usage, while the Ensemble has a built-in power supply with a standard IEC connection, last October Apogee introduced the Ensemble Mobile, which is functionally identical to the regular Ensemble in all respects, except that it lacks the built-in AC power supply. Instead, the Mobile features an XLR4 port so that it can easily be connected to a DC power source, and is conveniently supplied with an external AC to DC power supply having a regular IEC connection for when you're not in the field. In terms of audio, the Ensemble has eight analogue inputs, and the first four can accept either a line- or mic-level signal, thanks to the built-in preamps. All four inputs have both XLR and high-Z (high impedance) TRS connectors, although the high-Z inputs for the first two channels are usefully located on the front of the Ensemble, which makes room for the additional send and return insert TRS connectors Apogee have provided for the first two channels on the back. The remaining four inputs (channels 5-8) support line-level signals via TRS connectors, and an additional eight TRS connectors provide eight analogue outputs. For digital connectivity the Ensemble has input and output TOSlink optical connectors for either ADAT or S/PDIF input and output, in addition to regular coaxial S/PDIF, and there are also word-clock BNC connectors, along with a push switch so that the Ensemble can optionally self-terminate an incoming word-clock signal. Technically, the Ensemble can work at sample rates of up to 192kHz (and even offers hardware sample-rate conversion), but only the analogue and coaxial I/O are supported once you work with rates above 96kHz. S/MUX mode is supported for ADAT operation with the TOSlink connector, which can provide four ins and four outs at 88.2/96kHz. The front panel is clearly laid out and features 10 plasma-style meters. The first eight of these can show either the level of the analogue inputs or outputs, while the last two are labelled D1 and D2, and show the presence of signal in either the coaxial or optical digital I/O respectively. Two white LEDs to the right of the meters indicate whether the metering represents either the audio input or output of the interface, and it's also possible for the meters to be disabled if they should become distracting. Also featured on the front panel are two rotary encoders, one for controlling input levels and the other for output, and each show level via a ring of bright white LEDs. The input encoder allows you to set the gain for the mic preamp on the currently selected input, and you can set the current input by pressing the input encoder, which toggles through a set of blue LEDs to the right that indicates the selected input. There's also a corresponding set of red LEDs to show whether phantom power is enabled on each of the four mic pres, although the power itself needs to be turned on or off remotely from the host computer. The output encoder sets the level for the main output, and a really nice touch is that the Ensemble's software (see the 'Maestro' box) lets you configure whether the Main output is stereo, 5.1, or 7.1. For stereo, the output encoder controls the levels of the first two analogue outputs, whereas in 5.1 or 7.1 mode the encoder sets the level of either outputs 1-6 or 1-8 respectively. A 'line out' mode is also available, which effectively disables the main output volume functionality and makes the eight analogue outputs behave as independent line outputs. There are also two quarter-inch headphone jacks on the front panel, and, as with the input encoder, pressing the output encoder allows you to set whether you're adjusting the level for the Main output, or one of the headphone outputs (as indicated by another set of blue LEDs). What's especially neat about the headphone outputs is that they're completely independent, both in terms of level and in terms of which pair of the Ensemble's outputs they are assigned. For example, headphone port one could be set to the output of analogue outs 1 and 2, while port two is set to 3 and 4. This makes it very easy to create headphone mixes without the need for any additional hardware. Pressing and holding the output encoder for a few moments will mute the Main and headphone outputs, and the LED to represent whichever output was selected will start flashing to indicate the mute status. Pressing and holding the encoder again will release the mute. While this is a somewhat pedantic point in respect of what is a pretty well-designed front panel (especially the colour-coding of the LEDs), I really wish it was possible to configure the Main output encoder to mute on a simple press, rather than a simple press switching the selected output for level adjustment. Although this behaviour keeps consistency with the input encoder, I found the press-and-hold action for mute annoying, because I would use mute all the time, whereas selection of headphone outputs was something I rarely (if ever) needed to do. Some people might find the selection behaviour more useful (if they use headphones), but I wish Apogee would provide a quick mute option for those who might prefer it. 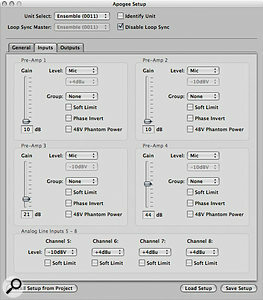 Logic Pro includes an Apogee Control Panel where you can access and store the Ensemble's settings directly from your Logic Project.Photo: Mike CameronThe supplied Maestro software serves two purposes: firstly, to provide hardware mixing and routing capabilities so that hardware inputs can be routed directly to hardware outputs; and secondly, to allow you to access and configure all of the Ensemble's internal settings. The mixing and routing aspects of Maestro were covered in the Symphony review, so it's worth referring to that article if you're unfamiliar with this functionality. One thing to bear in mind, though, is that while Symphony and the Ensemble both make use of the Maestro software, certain Symphony features, such as the V-Bus routing, are not available on the Ensemble. However, this isn't a big deal, since most native audio applications, such as Logic Pro 8 and Cubase/Nuendo 4.1, are now able to support this style of routing (where audio buses can be used as the inputs to audio tracks) without hardware assistance. One routing improvement that's been made since our last review is that it's now possible to route one hardware input to multiple software inputs, and, similarly but perhaps more usefully, it's also now possible to route one software output to multiple hardware outputs. This is great if you want to create different headphone mixes, for example. The Maestro Control window allows you to configure all aspects of the Ensemble's hardware setup, and this is where you have full control over the built-in preamps. Each preamp has a gain control, and a particularly useful feature is the ability to assign each preamp to one of two groups, enabling gain adjustments to be linked between preamps assigned to the same group. There are also phase-invert and 48v phantom power toggles, and you can also set whether to disable a preamp and use line level for an input instead. Each input and output level can be set to use a +4 or -10dB line-level signal (instead of a preamp on the first four inputs) and Apogee also provide SoftLimit, an analogue limiter that allows an extra 4dB of headroom, which can be enabled on any of the eight analogue inputs. To get started, simply install the Ensemble's software — although, as always, it's probably a good idea to make sure you download the latest version from Apogee's web site, rather than using any supplied versions. You can then plug the Ensemble into your Mac via one of the two Firewire ports found on the back panel. The second port is handy if you want to daisy chain other Firewire devices. The Ensemble goes into standby mode when it's connected to a power source, and, perhaps unsurprisingly, pressing the power button on the front panel powers up the unit for operation. A status LED on the front of the Ensemble lights up in blue if the device is successfully connected to your computer, or green if it's working in stand-alone mode without a computer connection. The status LED also has the potential to illuminate in red if you're really unlucky, and this can happen if you plug the Ensemble into your computer and a successful connection can't be established. In this case your Mac will probably kernel panic and the Ensemble will go into stand-alone mode. I found that having a kernel panic when connecting the Ensemble was not a completely uncommon occurrence with my MacBook Pro running Mac OS 10.5.2, although I admittedly don't restart the computer that often and usually have quite a number of applications open. Apogee's helpful manual shows the Ensemble being connected to a Mac prior to being powered up, although it doesn't seem to explicitly warn against doing this the other way around, which is what I would normally do, as I'd leave the Ensemble in stand-alone mode when not connected. According to Apogee, the majority of Ensemble users don't experience this issue, but Apogee are aware of it and are working with Apple to find a resolution. 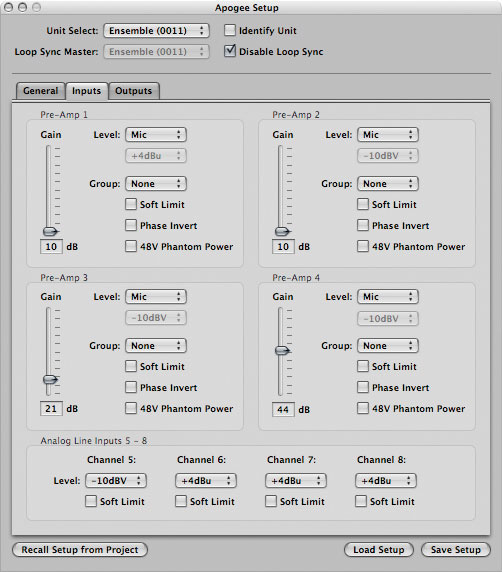 Once successfully connected, you can set the Ensemble to be the default audio input and output for your Mac in either Audio MIDI Setup or the Sound System Preferences Panel. When you adjust the volume using the Mac keyboard or the menu bar extra icon, you're then actually adjusting the Main volume on the Ensemble, and the Ensemble's output-level LED ring on the main output stays in sync with your Mac. Like Symphony, the Ensemble is also supplied with Apogee's Maestro software, which is used to configure the onboard routing and settings. Although the Ensemble works with any Core Audio-compatible software on Mac OS X, Logic Pro users are especially lucky as Logic incorporates an Apogee Control Panel (accessible from the Options / Audio menu) that allows you to adjust the Ensemble's settings within the application. While this is functionally no different to using Maestro in conjunction with any audio application, the neat thing is that the settings for the Apogee Control Panel in Logic are stored with your Project. This means that you can easily recall whatever mic-pre settings you had for a given Project, by simply clicking the 'Recall Setup from Project' button in the Control Panel once you've loaded up a previous Project. In terms of audio quality, you would expect the Ensemble to be of a high standard, and it certainly doesn't disappoint. If you're looking for some unquantifiable adjectives, I would say the converters maintain a good image, the bass frequencies sit well, and there's clarity in the high end. While the difference was admittedly subtle compared to my trusty Fireface 800, the Ensemble seemed to have a little more depth, with fractionally more space at the top. The only real problem I encountered when testing the Ensemble was when I decided to see if the record offset latency was handled correctly. On connecting one of the Ensemble's analogue outputs to one of the analogue inputs and recording a test signal (a click), I noticed that the input signal would be placed as if it was recorded before it was technically played. Obviously, this is physically impossible, so I contacted Apogee's technical support to see what was going on. Apogee's Director of Technical Services, Roger Robindoré, replied that "Apogee and Apple are aware of the issue, and have been working together to resolve it." The competition in the Firewire audio interface market is fierce these days, no matter what your budget, and the most obvious competition for the Ensemble is perhaps RME's Fireface 800, Metric Halo's Mobile I/O and Prism's Orpheus. The Fireface 800 is slightly cheaper, but offers 10 analogue inputs and outputs, along with a second ADAT input and output, while the Orpheus is basically Prism's answer to the Ensemble, but with a price tag equivalent to more than the costs of two Ensembles. Finally, Metric Halo's Mobile I/O 2882 is a bit cheaper, but is the oldest of the interfaces and doesn't support 176.4/192kHz sample rates. A version with onboard DSP effects is also available for roughly the same money. One area where the Fireface and Orpheus have a distinct advantage over the Ensemble is that they also offer Windows support, which could be important if you run Windows on your Mac via Boot Camp, or have additional Windows-based computers to which you'd like to attach a Firewire audio interface on occasion. However, if you exclusively use Macs, this obviously won't be an issue. A second point on which the Fireface and Orpheus score is that both offer a MIDI input and output port as well. Again, this might not be important to you, and Apogee's focus is clearly on providing best-in-class audio functionality; but it does seem a shame that for mobile use you may need to pack a MIDI interface alongside the Ensemble. Ultimately, though, despite a few remaining driver issues, Apogee have done a great job with the Ensemble, incorporating high-quality audio components into a Firewire interface that's easy to use, integrates well with Mac OS X (and Logic Pro), and offers flexible routing via the Maestro software. Although there are cheaper alternatives, the Ensemble certainly isn't overpriced, and I think Apogee have found a comfortable price point for the features and level of quality being provided. Good-quality audio converters and preamps, as you would expect. Integrates perfectly with your Mac. Built-in monitoring capabilities that are surround capable. Not compatible with Windows, which could frustrate Boot Camp users, or indeed PC users. The Ensemble brings Apogee's hardware and software technologies to an easy-to-use, high-quality Firewire audio interface. If its feature set is what you're looking for, Ensemble is an ideal centrepiece for any Mac-based desktop or mobile studio, especially if you're using Logic Pro.